When a police officer stops a vehicle and suspects that the driver is driving under the influence of alcohol or drugs, the officer will likely administer field sobriety tests. The results of these tests helps form the officer’s opinion about whether the operator was driving under the influence and about whether to arrest the individual for OUI/DUI. I am Attorney Stephen E. Dawley, and I am an experienced Framingham field sobriety test attorney, having helped many Massachusetts drivers overcome the impact of these tests. For more than 30 years, I have provided dedicated and caring OUI/DUI defense to clients in Massachusetts. Over my career I have developed my skills to attack these tests by police officers. If you have questions about field sobriety tests or any other aspect of drunk driving offense cases, please set up an appointment with me by calling 508-308-8191 or by emailing to steve.dklaw@verizon.net. One legged stand test: The police officer asks the driver to stand on one foot and count out loud for a specified time without falling or swaying. Walk and turn test: The driver must walk heel-to-toe for nine steps in a straight line, then turn around and repeat without losing balance. Horizontal gaze nystagmus (HGN) test: The officer has the driver attempt to follow a pen or other object with his or her eyes. This test is generally not admissible. Other tests include touching a finger to the nose or reciting the alphabet. Even without field sobriety tests, the police can charge you with OUI if he or she believes that you were operating under the influence. 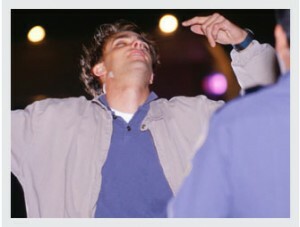 As with a breath test refusal, a field sobriety test refusal cannot be used against you at trial.